We all know that the State Meet always seems to bring out the best in our athletes. Our fields have been set and we have several events that should generate their share of excitement. Here's the ones we consider of the can't-miss variety. We picked this event because there is potential for three records to go down, the meet, state and New England marks. 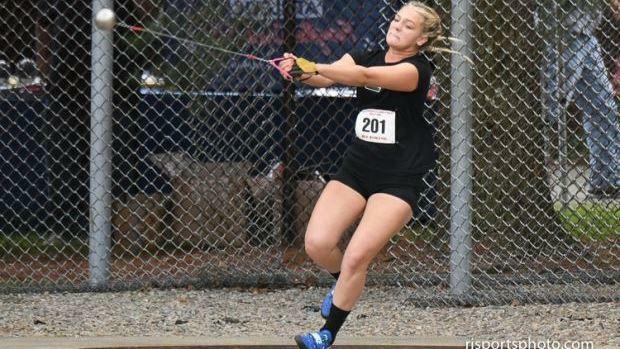 With a heave of 189-1 at the Mount Pleasant Invitational, defending champion Gianna Rao of Ponaganset was a mere two inches from the 17-year-old R.I. and New England record of 189-3. A week earlier, Rao threw 187-3 at the Class B meet and had a 188-1 toss at the Moretti Invitational a few weeks ago. She's seems to be right on target for a record toss this weekend. The State Meet record is 183-5. That should disappear after Saturday. Don't forget No. 2 seed, Barrington's Annika Kelly. She could pop a 180-foot throw. Her best now is 178-10. North Kingstown's Kaitlyn Brayman is hoping to get the two-for-one deal. She vaulted to a best of 11-6 to win the Class A meet. Brayman indicated after that she would like to join the 12-foot club. If she comes through with a PR performance she could wipe away the state record of 11-9 and the MR of 11-1.25. We can't picture any team winning this race but defending champion East Greenwich. The Avengers won the Class C meet with a state-leading time of 7:49, 20 seconds faster than their closest competitor. With all their members running other events in the meet, the question is will EG be focused on just winning or also running a fast time. If the Avengers go for the latter, say good-bye to the 2009 meet record of 7:55.05. This race matches the only two runners that have broken four minutes this season - La Salle's Joseph dos Reis (3:59.44) and East Greenwich's Jeffrey Pedersen (3:59.98). There's also North Kingstown's Sam Toolin, who challenged dos Reis until the final straightaway at the Class A meet and has a season best of 4:01.52. The fans at Brown Stadium are in for a treat in this one as this race could certainly go right down to the wire. On the line are three guys that like to be front-runners and three guys that appear to be peaking at just the right time - East Greenwich's Cebastian Gentil, Classical's Colin Murphy and North Kingstown's Jack Perreault. Gentil owns the fastest time with his 1:54.24 effort from the Moretti Invitational. Murphy won Class B in a best of 1:54.76 and Perreault was our Class A winner in 1:55.76. The 1993 meet record of 1:53.4 could be a jeopardy. This race features defending champion Nikki Merrill of Portsmouth against Westerly's Randi Burr, two runners that have had their share of battles the last few years. Based on her past success, Merrill gets the nod here, but don't count Burr out. The two runners have seed times of 4:42.76 and 4:43.9, respectively, but expect much faster on the state's biggest stage. Merrill won last year's State Meet in a PR of 4:29.70. Burr was third at that meet with a best of 4:36.54. Not a bad way to cap off a long day at the track. One of the final races of the meet could produce a number of runners under 8:40, possibly 8:30. The two leading contenders are East Greenwich's Jeffery Pedersen and Bishop Hendricken's Sean Meehan. Pedersen won the Class C meet last week with a state-leading time of 8:34.04. Meehan captured the Class A title shortly after with an 8:38.0 effort. The Hawks' Jack McMahon looked awfully strong against his teammate and could challenge up front. He ran a best of 8:40.84 at the class meet.